I have a phobia of red apples. Those red waxy ones that look like candles? Just thinking about them makes me cringe. I always imagined choking to death on the nasty waxy (sorry, no other word can more aptly describe it) skin and from there grew my phobia. I am infatuated with green apples however. Especially the Granny Smith ones…mmm. The crispness, the juiciness, the flavor. Wow! Hence, the need to make sure I clarify that I’m only referring to green apples, not red ones, when I speak of apples. Moving on. “You’re just like your father,” sighs my mother sometimes. I take it as a compliment. I mean, she loved him enough to marry him so it’s proof that she has good taste, right? I think though it’s said more in lovely exasperation at how alike my dad and I can be at times–usually when it’s something she doesn’t seem to “get”. Example? Our intense love of books. I think it’s genetic. Growing up, my dad always said, “Leaders are readers.” And since I hated being in the kitchen with my Greek sisters, mother and grandmother, I wanted to read as much as possible so one day I could join the men at the table discussing (as only Greeks can do) politics and religion. Reading was much better than cooking I decided at an early age. I read everything I could. I mean everything in sight. I still do it to this day without even realizing it. A lot of times it’s subconscious. Every sign that comes into my line of vision I have no choice but to read. It’s caused me to be able to speed read and still retain a large portion of what I read. The thirst for more knowledge is never ending in this tiny little brain of mine. My dad got me hooked on the library book sales and every so often I’d meet him next door to the courthouse downtown (before their book sales moved to the Lansingburgh branch) and we’d go through the shelves. Throwing out a title or topic we thought would interest the other. He knows I like broadcast journalism, writing, speaking (shocker, I know) and such topics. I know he likes…well, basically everything but novels. He hates novels. I picked that up from him I think. Very rarely can I read a novel either. I don’t read to be entertained, I read to be informed. A couple days ago my dad informed me he had picked up some books. That was an understatement. 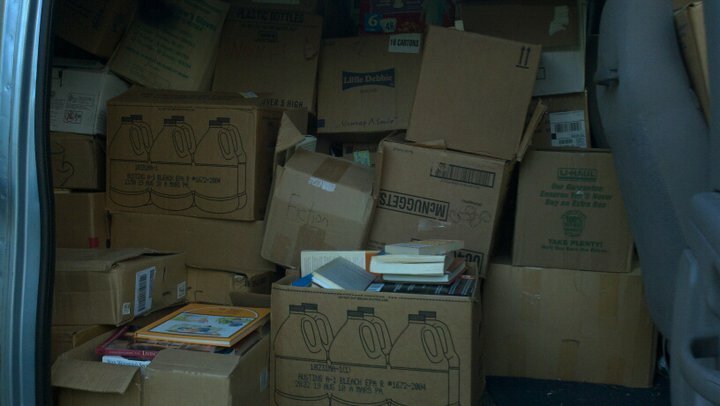 He had packed a 15 passenger van FULL of books. And so the past couple days, we have been a resilient team- going through every single book, reading the title, keeping what we each want, and arranging the rest on the front lawn for a brilliant 10 cent per book sale. Also brilliant? Letting Mom enjoy her out-of-state vacation with the grandkids without telling her what we’re doing to her precious lawn! Dad and I have spent hours working side by side the past couple days. The quietness of the summer evening punctuated by either of us reading aloud a title we think the other may like. The “keep for ourselves” pile keeps growing. I think of the thousands of books he already has in his library and wonder where we will put these. We’ll find room somewhere. Like a farmer plows his fields, I set up the boxes in straight lines across the lawns as cars start to pull over and avid book readers dig through the boxes and stack as many as they can in their arms. They may be strangers but we feel an unspoken bond over our love of the written word. I excitedly tell people to come back tomorrow as we just got another van full and are starting to unpack those boxes tonight. The sky loses the bright sun it had all day and I wonder if it’ll rain. Using several large tarps, we covered the boxes after every last bit of daylight had gone. My brother stands by, texting on his Iphone, making fun of us both. We all laugh. My brother is kinda sorta funny sometimes. He continues to make us laugh as Dad and I very nicely discuss how we each think we should place the tarps over the books. My way ended up the wrong way. Not the first time it’s ended up that way. I count the money we’ve made so far. Almost $40! This is fun! We should do it every day! I fill the back seat of my convertible with the books I chose so I can read them while at my shop. I think about the numerous times I’ve told my dad that he had better leave me his books in his will. I want nothing else. As I head into my parent’s house and see the green Granny Smiths my mom bought sitting on the counter, I think to myself how glad I am the (green) apple didn’t fall far from the tree.